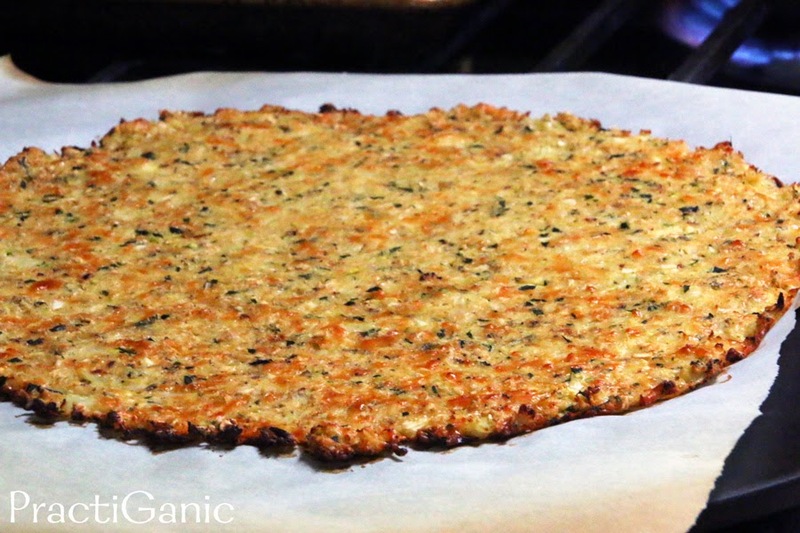 Cauliflower pizza crusts. They seem to be quite the rage these days (or years). I have made countless of them and the outcome is always the same ... me using a fork to eat them and it's a soggy mess. A friend recently asked me if I had a recipe for a good one. I laughed and said the concept is great, but they just don't work. After a while, this comment started to bother me. If people love them, it can't be just an idea. Someone, somewhere had to have made one that worked. The challenge started to build inside of me. So, I grabbed a head of cauliflower on my next trip to the store. I said nice things to it, gave it a pep talk about what it was about to endure ... I really got it excited! That night, I just didn't have it in me. I wanted a good dinner and I wasn't about to have a soggy pizza. So, the cauliflower sat. The next day, I gave myself the pep talk. I was ready to make a crispy crust no matter what. All day long, I pondered this achilles heel of pizza crusts. I scribbled and rewrote different ideas. 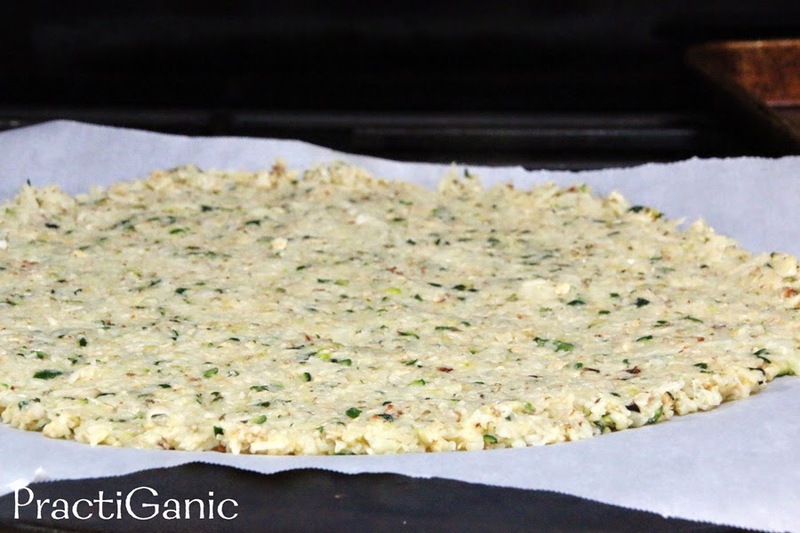 Should I use oats or garbanzo bean flour? Should I even use a flour? Do I want it vegan? All I knew is that I wanted to roast the veggies because I love that extra flavor. I went with oats because they soak up more of the liquid. I used cheese, well ... because I love cheese. Alright, it was time to make this crust! I was such a Negative Nancy. The whole time, I was feeling bad about it. I knew I was wasting my time. I took some pictures of it just in case and they whole time I was telling Paul that I didn't know why I was taking the pictures because it's not going to turn out. Well, since I'm still writing this post you know how it turned out ... AMAZING! 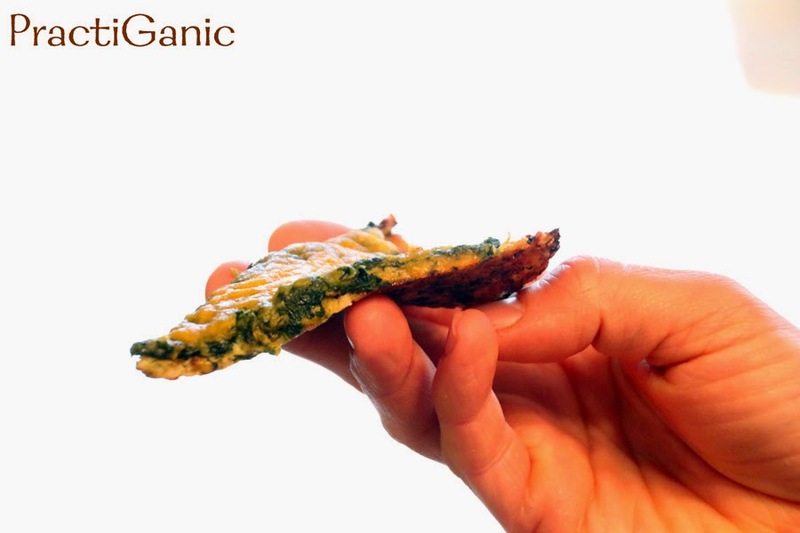 It was flavorful, crispy and delicious! The very middle isn't as crispy as the outside, but it was still crispy and was able to be held up to eat it! No fork needed! It was a grand day in the PractiGanic kitchen. I was still so floored that it worked out, I had to try it again. Was it a fluke? Let's just say, the second, the third and the fourth times were all as good as the first. I'm hooked! I love this crust. 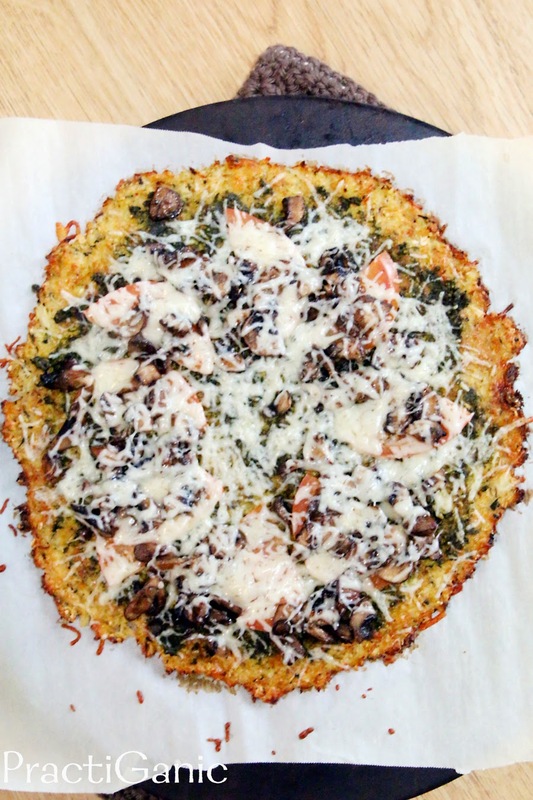 Sorry, Thin Crust Pizza Crust, I still love you, but variety is the spice of life and this cauliflower pizza crust is perfectly spiced! 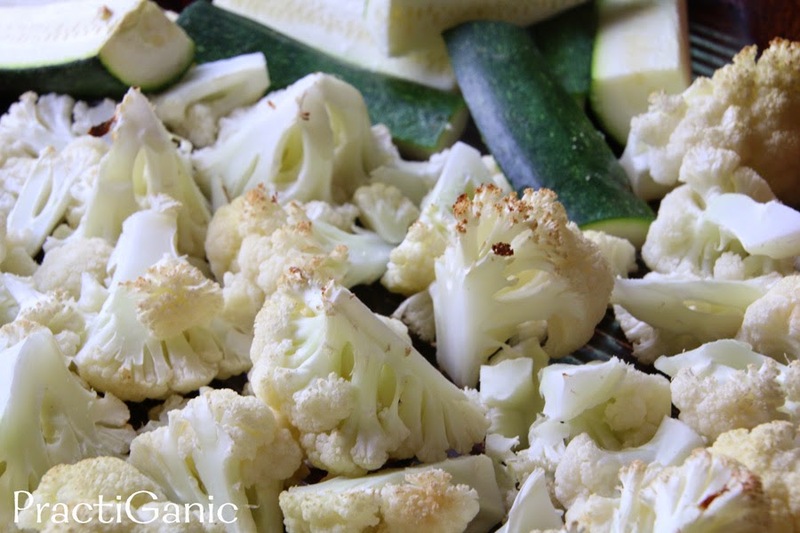 Cut cauliflower into 1 inch chunks. Feel free to use the stem and the florets. Cut the zucchini into large chunks. Place them on a pan and roast them for 15 minutes or they begin to brown. Once you take it out of the oven, place your pizza stone in so it has time to heat up. 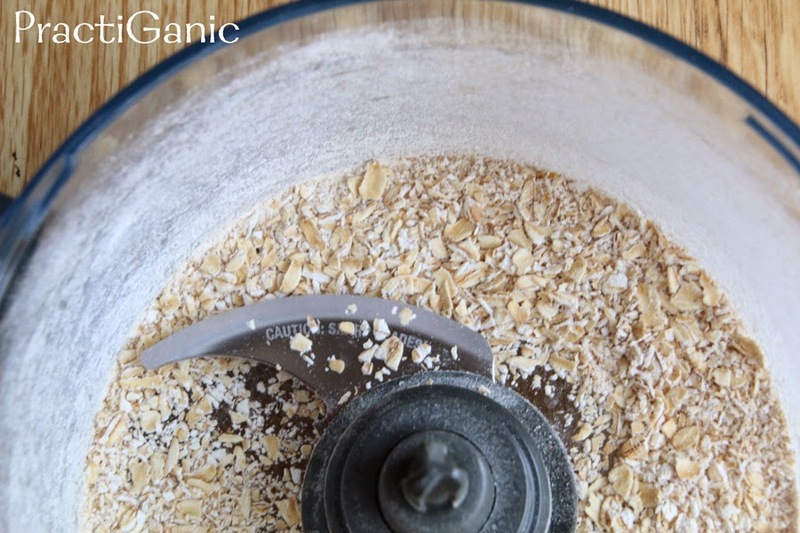 Meanwhile, in your food processor, pulse your oats a couple times to break them up. They don't have to be completely dust. In a bowl, mix the oats with the cheese, egg, garlic, oregano and salt. 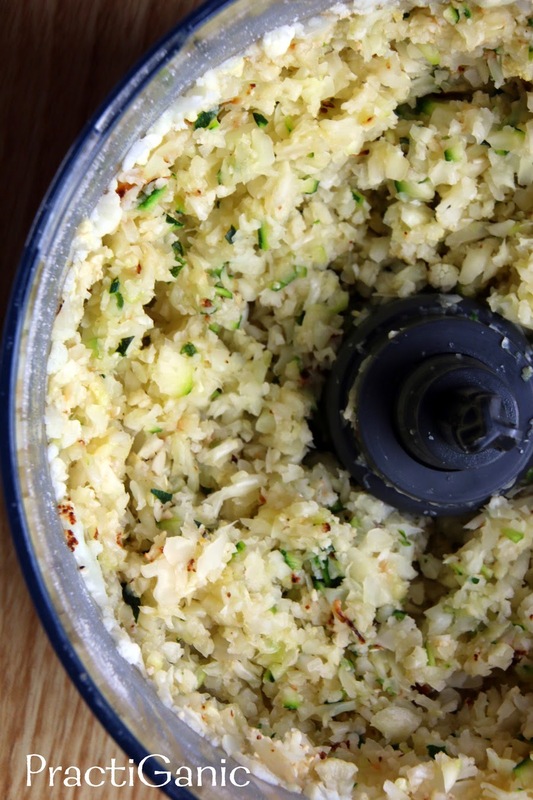 Once your zucchini and cauliflower are our of the oven and cool enough to handle, place them in the food processor and pulse until they are shredded into fine pieces. This is the most important step ... are you ready?!? 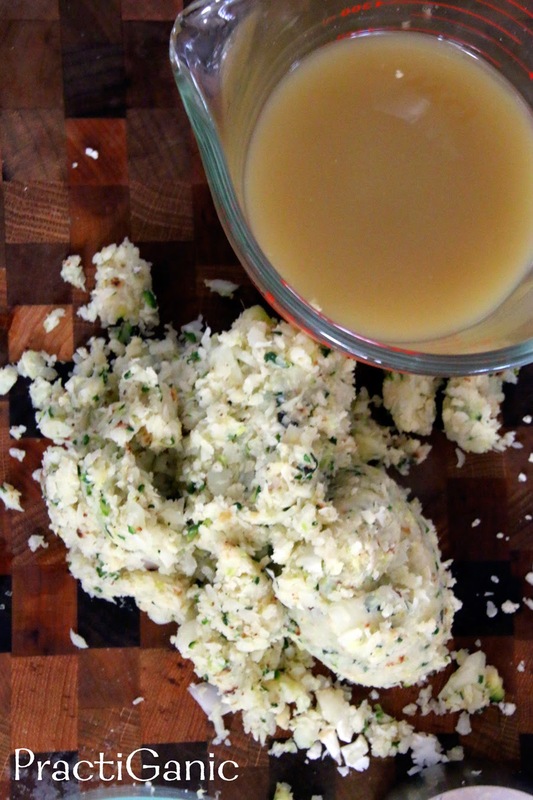 Take the cauliflower and zucchini mixture and squeeze it until you can't squeeze any more! 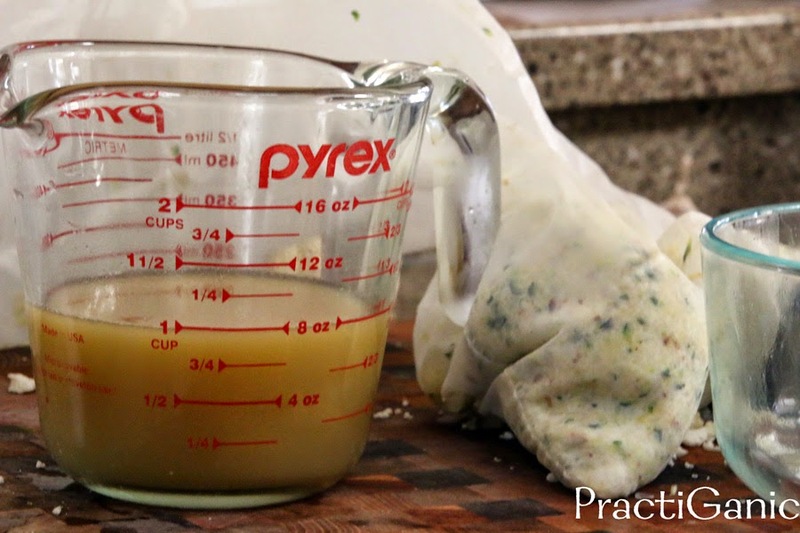 I use a grain bag, but a cheesecloth or thin towel will work too. I get about 1 cup of liquid out of my mixture! and am left with about 1 1/2 c of a crumbly mixture. Now, add the roasted vegetable crumble to the oats, egg, cheese and spices and mix well. 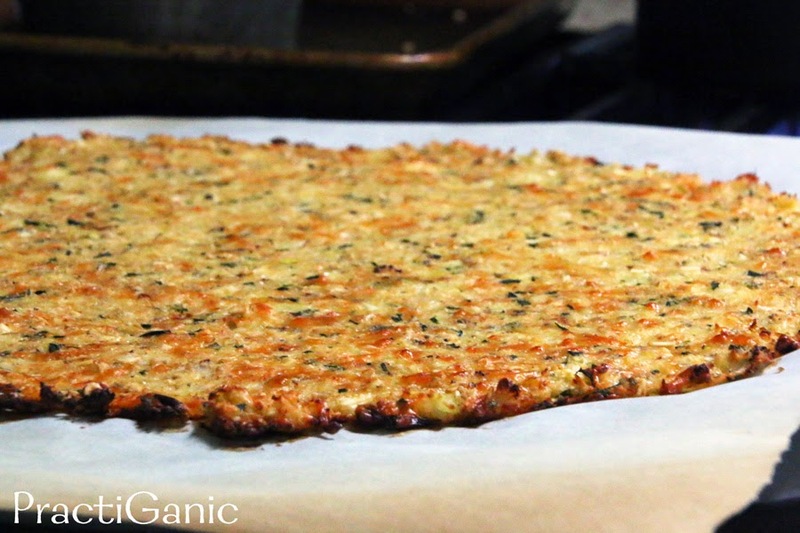 Place a sheet of parchment paper on your pizza stone. Drop the mixture on the paper and spread out into whatever shape you would like your pizza to be! It should only be about 1/4 inch thick ... as thin as you can go without having a hole. It's finally time to bake it! Bake the crust all by itself for 25 minutes. The pizza should be nice and brown. Feel the middle to make sure that it is firming up. If it's not, go a couple more minutes, but be careful because you don't want the outsides to burn. Then, top with your favorites** and put it back in for 5 more minutes so the cheese can melt. Let it sit for a couple minutes before cutting. Finally ... eat up! Phew, that was a lot of work, but it's worth it! **Because this crust is more delicate, I don't like to have very wet sauces or heavy toppings. 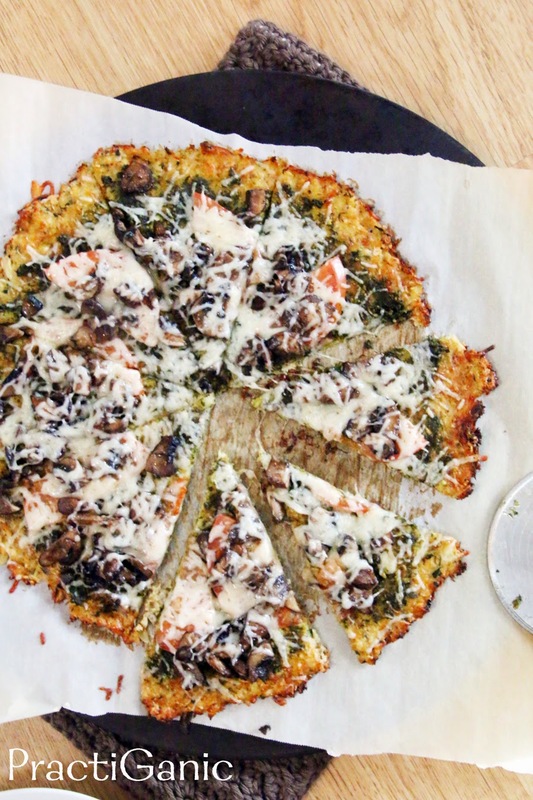 Don't use raw veggies because the water will soak into the crust. As you can see, I did use mushrooms because I wanted to make sure it could hold up to the weight, but I did precook them.